Bring quality and reliability to your garden work with the Nisaku Mikadukigama Grass Sickle. Designed for weeding and cutting tall grasses, this essential tool features a sturdy wooden handle and a stainless steel blade with a precision edge. Lightweight, this Japanese sickle can be used with minimum exertion to cut long grass and standing weeds. Nisaku Stainless Steel Mizukatana is an excellent multi-functional tool for a vide variety of outdoor applications. The sharp, stainless steel serrated edge cuts through most materials in a single swipe, and showcases a balanced design with a gut hook feature and comfortable grip. 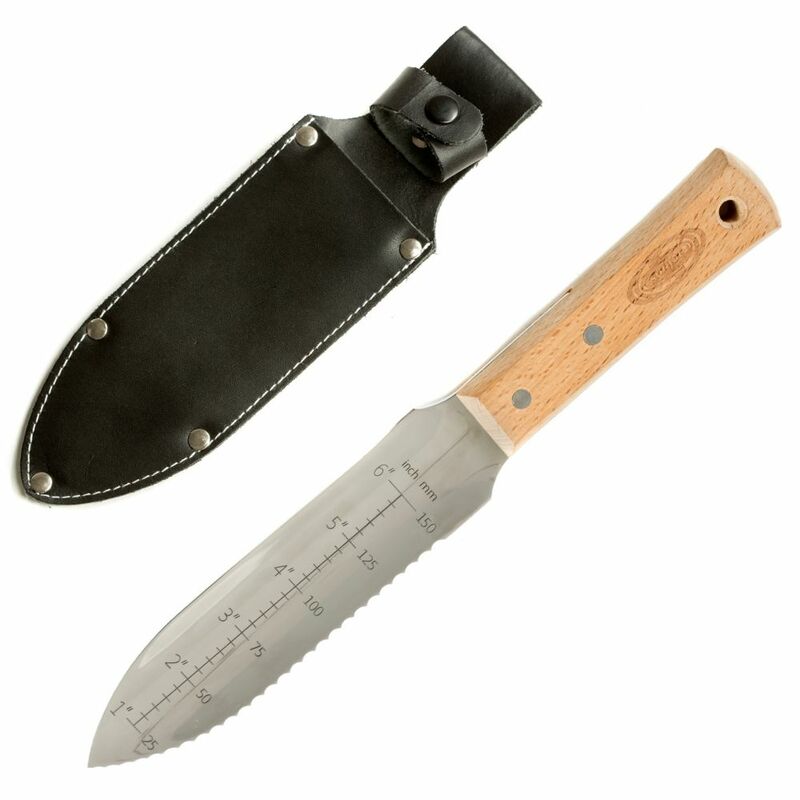 The fine edge, and flat tip blade affords ultimate utility for outdoor tasks alike. This special edition model is forged with a higher quality DSR-1K6 stainless steel, making it more durable than traditional outdoor knives, and requires minimal sharpening. Includes a sheath. Hori-Hori Garden Landscaping Digging Tool with Stainless Steel Blade is rated 5.0 out of 5 by 7. Rated 5 out of 5 by Grandma Gerry from Great product This product works well. Makes gardening and weeding very easy. Rated 5 out of 5 by DennisS from I live in South Florida and always have a big problem with crabgrass in my yard. I have tried num... I live in South Florida and always have a big problem with crabgrass in my yard. I have tried numerous weeders over the years but I wish I would have found this knife long ago.Ridding the yard of crabgrass is never easy but this knife is so good and works better than any weeder I have ever used.The blade is sturdy and when you get the knife under a big clump of crabgrass you and use the saw edge to go all the way around and pull out the whole clump roots and all. I can't give it more than 5 stars but if I could I would!!! Rated 5 out of 5 by Goldie B from Sturdy tool will be useful in the garden. When weeding, transplanting, planting new plants or bulbs, this will be a pleasure to use. It has a serrated edge, is sharp, will easily cut through roots, sod, etc. This is a very sturdy tool. Rated 5 out of 5 by Liz0780 from I just received my shipment last night and the hand tool will be perfect for digging up my treasu... I just received my shipment last night and the hand tool will be perfect for digging up my treasures I find metal detecting. The hand shovel has two very sharp edges that will be good for sawing through those stubborn roots in the ground. Rated 5 out of 5 by Penzance from Wonderful tool This is a fabulous tool, I wish I had found it years ago. The serated edge easily cuts through sod and tree roots, it`s not going to bend any time soon as do cheaper spades, and the shape works great for a digger. Rated 5 out of 5 by Lyubov from Excellent! Great product. Very sharp, durable, precise. easy to use. I am using all the time. I am very happy with my purchase. Snow Joe is my favorite brand, I have several Snow Joe items.